"Booker Ervin's tenor is like a giant steamroller of a brush, painting huge patterns on a canvas as wide and high as the sky." Strangely enough, Texas, chiefly noted for the export of smug tales and Lyndon Johnson, has begun to flourish in recent years as an incubator of fresh, exciting jazz talent. When trumpeter Kenny Dorham came to New York almost two decades ago, he was somewhat of an anomaly, but for a different reason. Other outstanding instrumentalists such as tenormen James (The Twister) Clay and David (Fathead) Newman have come up to the jazz big leagues from "down yonder." Booker Ervin has traveled a long, rough, lonesome and frustrating road from his birthplace in North Texas to growing acclaim in New York. At Terell High School in Denison, Texas, he became a member of the school band, performing as a trombonist. In 1945, Booker enlisted in the Air Force upon graduation from high school, where he borrowed a tenor sax from the Service Club and began to teach himself the instrument. When the tour ended, he went home to Texas again and got a job, saving up for a musical education. He put aside enough in 3 months to finance a trip to Boston, where he entered Schillinger House, now known as the Berklee School of Music, for a year of study. On his return, Booker went out on the road with a rhythm & blues band led by Ernie Fields which was working out of Tulsa, Oklahoma. The band was one of those rough and ready 10 piece, ultra-rhythmic aggregations so popular in the dance halls of the South and Southwest. Booker says he learned a lot about swinging from playing with the band's "back-beat" rhythm section. "The basic feeling, you could even say primitive feeling of this band, with the drummer 'chopping wood' all night long, gave you a big feeling of power; you wanted to just open up and wail." Fields' group has been the launching pad for a number of successful jazz careers, including among its alumni Benny Powell, trombonist with Count Basie. From the Fields' band, Booker went to Dallas and gigged with James Clay for several months in 1955. When work ran out, he set out for Portland, Oregon on a Greyhound. Like the man who came to dinner, he stopped to spend "just one night" with a buddy in Denver and stayed on 18 months. Dividing his time between the study of drafting and sporadic club dates, he tried several times to give up jazz, but found that he had to play. Thus after years of wandering he turned east. He came through Pittsburgh on his way to New York. He met Horace Parlan, the learned and talented pianist, and his life as a musician of prominence was soon to begin. He and Horace came to the city, Horace to work with the Charles Mingus group. When Mingus needed a replacement for Jimmy Knepper, Parlan suggested Booker Ervin. Mingus summoned Booker for an audition, and making up his mind with the speed of lightning called Ervin to join the group six months later. Booker played with Mingus for over a year, making several important records which brought him the recognition he deserved. "Mingus's charts demanded that I play equally well in all registers of the horn, that I learn to read the most difficult music without faltering, playing it right on down with feeling, and that I learn to go farther out harmonically than I had ever gone in my solos." It is a pleasure to present a young man who plays tenor with a wild sweetness, with dizzying velocity, and an angular modernity which is not devoid of personal warmth, beauty, and humor. This album showcases the work of Booker Ervin, a rising jazz star, who has paid 11 years of "dues" to bring to you his message. 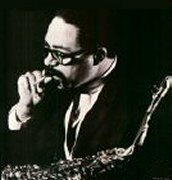 A selected discography of Booker Ervin albums. The Blues Book, 1964, Prestige. Settin' The Pace, 1965, Prestige. Back From The Gig, 1968, Blue Note.